Since 1999, nearly 2,500 female rally participants have demonstrated that classic car rallies are not just for the boys. Strong women have played a role in automotive history since its very inception: in 1888, Bertha Benz was the first person to drive an automobile over a long distance. Later, female race drivers such as Hellé Nice and Maria Teresa de Filippis would shake things up, the latter at Formula One. And in the 1980s, Michèle Mouton demonstrated how to push a rally powerhouse like the Audi Quattro S1 to its limits. And yet, for many people, the automotive world is one strictly for men, and the world of classic cars is no exception. Women such as the Louwman sisters can drive their classic sports cars on the Mille Miglia with as much skill and grace as any man, but they still remain outsiders. For women who want to drive their classic cars in a rally without being eyed critically from all sides, it can be difficult to find the right event – or they can go straight to Viviane Zaniroli, founder of the Rallye des Princesses. The French classic car enthusiast organizes and hosts this classic car rally for women every year. "Women enjoy classic cars just as much as men do!" Please tell us a bit about how the Rallye des Princesses came into existence. How has the feedback been over the years? Men often dismiss smaller town cars as “women’s cars.” The Rallye des Princesses appears to prove them wrong. At the race, we see everything from Volkswagen Beetles to Corvettes. 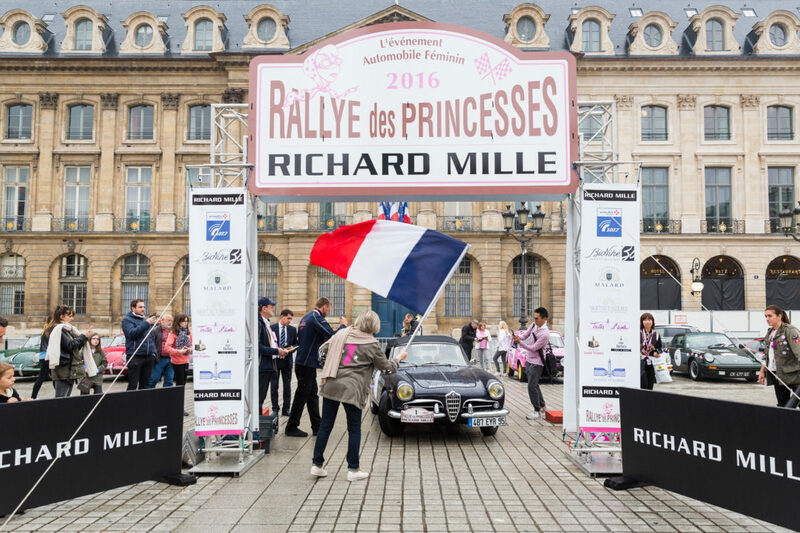 Of course ​the Rallye des Princesses proves that women enjoy driving sporty and classic cars just as much as men do! Often the participants are driving really impressive cars – proving that this kind of competition is not just for men. If you had your choice, what car would you most like to drive in the Rallye des Princesses? This cliché is something we hear from men who get annoyed when they see these women behind the wheel having fun – but today the mentality is changing, the spaces are completely booked out in just two months with a long waiting list, and it is one of the top five most prestigious and challenging rallies held regularly in France … and it is solely for women! What are the most demanding stretches for drivers? ​The name Rallye des Princesses says it all – on the one hand, you have a rally, and on the other, you have princesses. So each day, the rally is very challenging – the drivers only travel on small, winding roads that are extremely hilly, time is taken using GPS, which is necessary in order for us to precisely determine the times, but when they arrive at the end of the final stage, the drivers are treated to an elegant, comfortable hotel, a glass of champagne, a cosmetic gift bag and a great deal of conviviality: and that’s where the “princess” aspect comes into play. Where do most of the participants come from? You’ve already answered your own question! ​They are serious during the regularity trials and determined to get the best results, but they are also having fun because this is their week. Women generally cannot take several weeks every year for races because they have so many other responsibilities – work, children, etc. – so they make the most of this week that is just for them. The 2017 Rallye des Princesses is nearly upon us. What do you think the highlights will be this year? ​For the last three years, our main highlight has been our partner, Richard Mille, who brings a great deal of attention to the event. In terms of motor sport, we have not changed that which has made the rally a success from the start – five days of challenging driving through the mountains with lots of passing – this always makes for a very memorable race.​ This year is also the rally’s 18th anniversary, ​and we are celebrating with a fabulous party in Saint-Tropez! For more information, please visit the website of Rallye des Princesses.